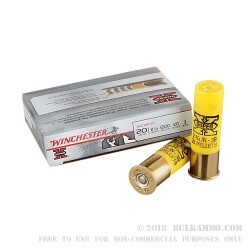 Hunting with 20 gauge ammo and need the kind of versatility that would allow you to take multiple tags out, or that would keep you safe if you ran into a bit of a dangerous spot with a predatory animal? 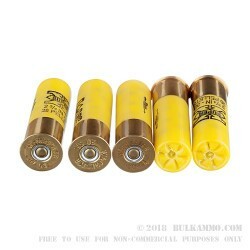 This is a perfect 20 gauge shell to take hunting (where permissible-check your state and local regulations), for big game and still offers usable ballistics for predator animals and gives you peace of mind for multiple tag outings. The nice velocity and the #3 buck size gets quite a bit of power out of the 20 gauge shotgun for big animals like deer, while still providing the type of versatility and variability that you have come to expect from your shotgun in the field. 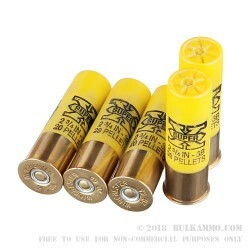 The round is capable of 25-60 yard kills on small and moderately sized predators and deviates only a little bit for clean kills on animals as large as deer, where you can expect to find a sweet spot of about 25-40 yards, while still maintaining best practices while hunting. 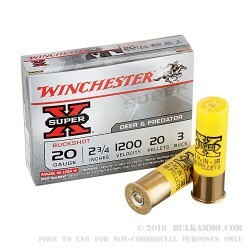 This is an exceptional range for shotgun hunting and is a testament to the build quality of the Winchester Super-X line and the #3 buck’s power and consistency in performance.